Do you know someone who has been hurt climbing Mt. Whitney? 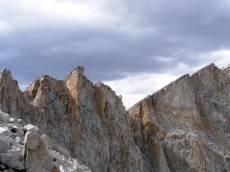 I've been hiking Whitney for many years and have seen an avoidable injury each climb. Doug and Earlene Thompson owner of the Whitney Portal Store have seen more than 22 seasons of accidents, problems and situations on this famous mountain. The altitude at the trailhead, known as the Portal, is 8,000 feet, and the peak rises to a dramatic 14,447 feet. This equates to more than 6,000 feet of elevation gain in 11 miles. The combination of Sierra wilderness, high altitudes and weather that changes on a dime can have a severe impact. Temperatures can drop 45 degrees in an hour, it can snow any month of the year, and lightning is common. Whitney is the tallest Mountain in the contiguous United States, and hundreds of hikers and climbers make this pilgrimage each day during the permit season from May 1 to Nov. 1. As many as eight incidents per day can be seen on this mountain ranging from sprained ankles, to exhaustion to broken bones and fatalities. The most incidents seen are individual hikers who have been separated from their hiking buddy or group. Surprisingly, day hikers have more incidents than overnight backpackers because of their higher numbers combined with an inability to properly assess the ability to do a roundtrip 22-mile climb which takes an average of 12 to 14 hours. With a steady stream of hikers seeking to gain the summit trophy, the percentage of risk is high, but the most common cause of incidents is unpredictable much like the mountain itself. Surprisingly most accidents and incidents could be avoided, and the key contributing factor hinges on leadership. According to Doug Thompson and Inyo County Search And Rescue (SAR), the majority of incidents are not based on severe wilderness conditions, but on human error. Group leader failure – Lack of leadership resulting in miscommunication, bad planning, individual's breakaway from friends or group, and having no well-defined emergency plan. Car keys – Hikers sometimes finish ahead of their friends and forget car keys resulting in no place to sleep, sit, eat, and without gear and money while temperatures drop near freezing at night. Dehydration or exhaustion – People on the trail become exhausted and forget to eat and drink, which results in item 4. Flawed decision-making – Resulting in the No. 1 injury on the mountain, item 5. Slip and falls – Can range from a scratched knee to a fatal fall. Flashlights – People forget they are returning down the mountain in the dark and don't bring flashlights, or they use the flashlight too much and get vertigo from the bouncing light. People not at trailhead at estimated time – When people fail to show up on time, friends presume someone is injured or lost. This can result in false calls to SAR, taking us back to item 1. Leadership, separating ego from ability, good judgment and the skills of mountaineering are the most important things to carry in your pack and will help avoid an emergency situation. "Each year someone is going to die up there, and it's a terrible process for the people who remain," said Doug Thompson, who has 23 years of experience on the mountain. "Nobody took you up the mountain, you shouldn't expect anyone to take you down." For more information on training for Mt. Whitney, join ochbc.org. Membership is free.